Today’s post is a full scan of the 1986 publication Преглед на Спомениците и Спомен-Објележјата во СР Македонија, a book compiled by Gjorg Trajkovski detailing monuments, memorials, commemorative plaques, museum-houses, and other commemorative objects in the Socialist Republic of Macedonia, dedicated to events and personages ranging from the period of the National Awakening to the antifascist National Liberation Struggle and the rise of socialism. 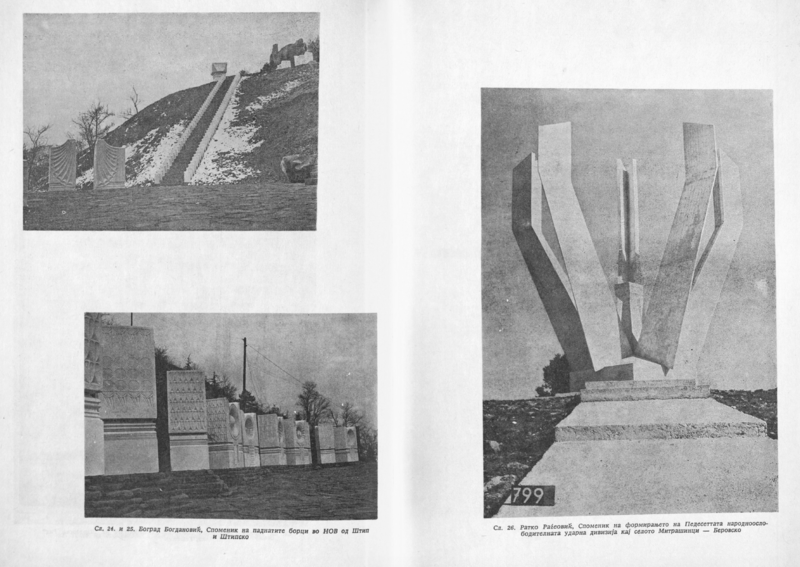 The publication contains extremely extensive reference information (although it is of course impossible to know if it is comprehensive), including not only the names of monuments, their locations and dates of inauguration, and the names of artists and architects, but also information on the reasons for their construction, lists of names of those commemorated (in the case of cemeteries, for example), etc. The visual documentation in the publication is minimal: a few key works are highlighted in the final section of the book with photographs, while most of the entries are not visually documented. In this sense, the book presents a different kind of publication than others I’ve uploaded here, many of which sought primarily to present the visual dynamism of socialist monumental art and commemorative architecture. Here, instead, the goal is a careful cataloguing of monuments and their basic information. Nonetheless, the resource is invaluable for anyone studying monumental sculpture in the former Eastern Europe more broadly, or in Macedonia in particular. The Pope’s visit to Albania brought with it a number of changes in the public face of Tirana: I admit that I have followed these urban restorations (mostly centered, as far as I have seen, on Mother Teresa Square) only casually in the media, and have insufficiently pondered their full import in conjunction with Edi Rama’s disturbing rhetoric, with its combination of fiery neoliberal Europe-adoration and barely-concealed orientalism. In the midst of many other discussions about the significance of the Pope’s visit, I nearly forgot an event that appeared in the news in early September, and then seemed to pass into oblivion: the removal of the two Mother Teresa statues in Mother Teresa Square (by Thoma Thomai) and in the Rinas Airport (by Luan Mulliqi) for cleaning, restoration, and eventual replacement in preparation for the Pope’s visit. Ultimately, the plan was for the two statues to switch places—the Thomai going to the airport and the Mulliqi (possibly) coming to the square—but I have not seen any evidence that this was completed on schedule. 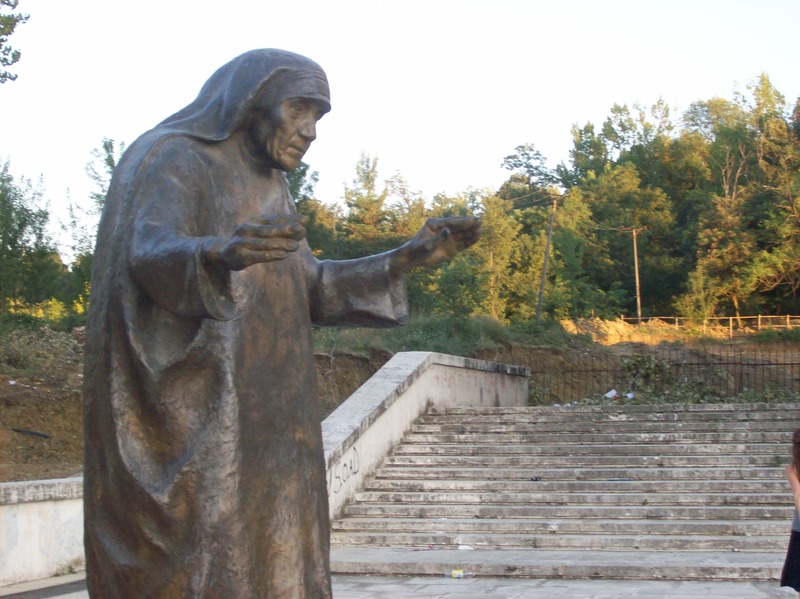 In fact, I would welcome information from those who were in Albania for the Pope’s visit (or who have simply seen news broadcasts I have not seen) about whether or not the statues—one or both—have found their new homes. In either case, the case of the two statues’ cleaning and restoration is fascinating for its symbolic significance. I should say at the outset: I am entirely supportive of the actions taken to keep both statues in good condition, and I have absolutely no interest in the aesthetic merits of either statue. The decision to re-assess the appearance, integrity, and placement of the statues would, in my opinion, have been appropriate regardless of the impending visit of the Pope. However, the relationship between these two events introduces an entirely different discourse that I think cannot be avoided, even if it only lurks in the peripheral subconscious of political debates surrounding the Pope’s visit: the cleaning of the female body. Allow me to describe the event in slightly different terms: in preparation for the visit of the Pope, representations of Mother Teresa’s body were found to be impure; they were not only unclean, but also contained internal impurities requiring the intervention of experts to prepare them for the physical presence of the Father. Further, their physiological defects were noted, at least in the case of Mulliqi’s “sticklike” figure. The very process of their creation was found to be lacking (again, in the case of Mulliqi’s work, which was “realized in less than optimal circumstances and cast in a defective manner” according to Agim Rada). I do not want to overstate the point, but I think that the full import of the discourse of cleaning and purification cannot be overlooked—we are not simply dealing with material facts, although it is in itself of interest the care taken to assert the role of ‘experts’ in the intervention on behalf of the sculptures: “It would be best for public opinion and news agencies to consult with us, the specialists in this field, before releasing any news about this matter,” as Agim Rada put it. However, in some quarters, the abject positions of Mother Teresa’s body was cause for outrage: they suggest that her body has been left like garbage to decay, without its due respect. This alone should be enough to remind us of that these monuments are not simply bronze: they are animate sculptures that hold, for some, part of the holiness of Mother Teresa’s body and spirit within themselves. The treatment of the statues is not simply symbolic: those who are restoring them (or leaving them lying about in the bushes and trash, as the article insists) are profaning the body of Mother Teresa herself. Thus, the discourse surrounding the statues is both that of the sacred body of the Mother and that of scientific expertise, as much as it is also that of political rhetoric. So, to return to the question: what are we to make of the need to purify the female body—and not just any female body, that of Mother Teresa—in preparation for the visit of the male figure whose visit, as Edi Rama put it, “rilindi Shqipërinë në sytë e botës” [read: in the eyes of the Western world]? We cannot, I think, ignore the parallels between a number of different discourses of purification, such as that directed against the taint of Islam, which a close friend has elaborated here. Ultimately, like the Albanian nation placing itself before the Western Gaze, Mother Teresa’s body was found wanting—it was in need of an intervention, of the hands and tools of specialists, to make it ready for the Father’s presence. I am wary of psychoanalytical and metaphorical readings of collectives that try to impose too all-encompassing a reading on events that are as often as not chaotic, unplanned. But—for there is always a but—should we not see the cleaning of Mother Teresa’s embodiments as part of the discourse on the cleanliness of the female body in modern society in general? As part of the troubled and troubling attempts to ‘preserve’ and ‘protect’ the family in Albania? The attempts to wash whatever is impure so the West sees nothing but cleanliness when he comes looking? To rid the flaws from that which was “realized in less than optimal circumstances and cast in a defective manner”?